11. The Coast of Death and Beyond! 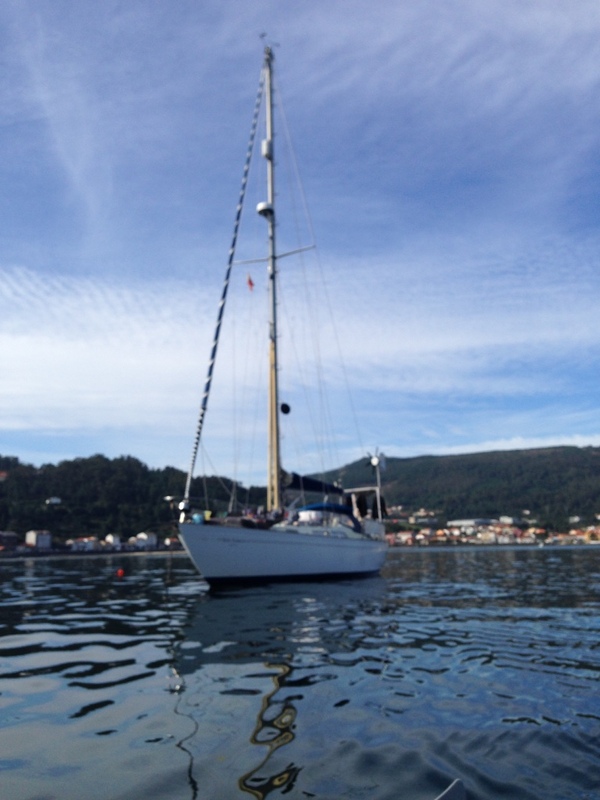 Our first anchorage at Muros lay on the Costa da Morte – The Coast of Death! – foreboding enough for a decent headline we feel, even if it is slightly melodramatic for anything experienced while there…. 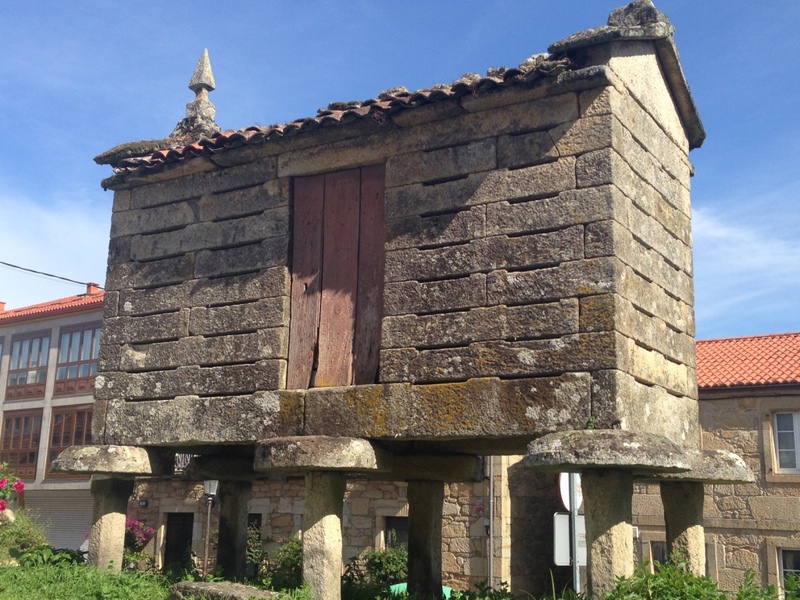 A Galician grain store to keep the rats out! It all started so well, as these things usually do… We decided to try the outboard out, as the last time we’d used it was in Brighton several months ago, and it hadn’t been running too well (it’s a 2-stroke, and we suspected we hadn’t got the fuel/oil mix quite right). We lifted it on to the tender using a halyard which worked pretty well. Although the freeboard (side of the boat above the water) isn’t as high on RR as some modern yachts, it is still high enough to make things like lifting the outboard over the guardrails and down to the tender a bit of a challenge. The engine started *fairly* well, and soon we were off! About 20m off the boat, the throttle spring went and the throttle just flopped about on its own, meaning we had to hold that in position as well as steer… Something else to fix! We normally used the beach for the dinghy, but decided to tie on and leave it in the water this time for a change, and reached a set of steps leading up to the waterside pavement a bit nearer the town, tied her on and got out. We had also managed to forget Bella’s lead, so Jamie sacrificed his belt and held his trousers up for the rest of the afternoon… A good walk around and runabout on the beach was had before heading for some supplies at Gadis supermarket. I went in to do the shopping while Jamie headed back to the tender. As I came round the corner, Jamie was frantically waving me over – I figured there must be something really cool to see, so I broke into a run… until I saw that Jamie had his belt back on, Bella’s new lead was the tender painter (tying on rope), and there was a Spanish guy on a mobile phone standing next to them… Something wasn’t quite right, but I couldn’t work out what…. Until Jamie pointed out the dinghy. Floating on its own. Quite a way from anywhere we could get to it…. We established that the man on the phone was speaking to his mate in the port, trying to arrange someone to motor over and save it for us… It was floating tantalisingly out of reach of land by about 15m either side, 10m below us, and in between the steps we had tied it to and a small beach by (of course) the local police station… I stayed up top with the guy on the phone, while Jamie jumped down to the police station beach and started to weigh up the pros and cons of wading in to retrieve it. We were worried about the prop of the outboard getting damaged on the rocks it was washing towards (the tilt lock on the outboard doesn’t work either…), when a bloke cycled up beside me. Lots of people had stopped for a good look, but I tried to explain to this guy what had happened. I explained that it looked like the current was going to push it towards the beach, so hopefully the situation would resolve itself in a few minutes.. However, the cyclist was not to be put off! He went down to the small police beach where Jamie was, explained he was a marinero (one of the guys who works in the marina moving the boats around – not sure that this fact helped him to do what he did next, but he was still a hero to us! ), and promptly took off his socks, shoes and jeans and waded into the lapping waves in his pants to rescue our errant dinghy!! He did however stay to chat for a while and we told him of our plans to move on to Baiona (a day’s sail away southwards, close to Vigo), at which point he warned against leaving the following day – the weather was due to come in. To give him his due, it did come in. In a fairly big way, and we were extremely grateful for his local knowledge. The next morning we woke to blanket fog and winds that varied from 0kts to 25kts on about 2 seconds’ notice. At least the wind turbine got a good workout. That weather stayed with us for a further couple of days, and was accompanied by somewhat heavy rain. We decided that actually we didn’t *need* to sail in unpredictable winds and driving rain, so we wouldn’t! Now we were round Finisterre, we shall sail when it is nice and sunny, and there is a good constant wind from a good direction so we don’t have to either motor or beat the whole time. It feels like a luxury given the somewhat hectic passages of the last month! We spent the time doing some of those ever-present jobs around the boat, as well as relaxing, reading etc. We had bought some bacalao (cod preserved in salt) in La Coruña, and I had set that soaking in water for a couple of days (as per the greengrocer’s instructions….I think…), so we decided to make some risotto and grill the cod (again, according to our understanding of his instructions…)… It was delicious (even though I do say so myself etc…)! It was nice to try out something local too. 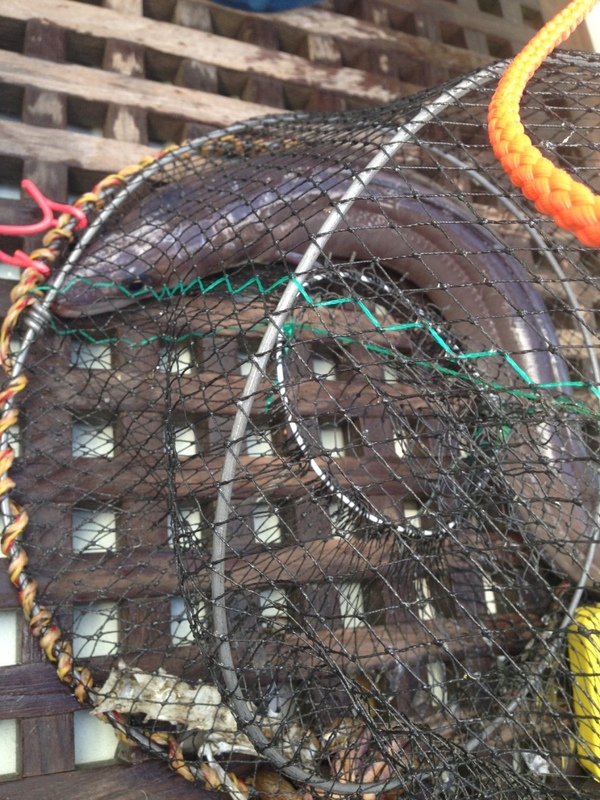 And since we hadn’t caught any lobster yet…. We used the spine of the bacalao in the lobster pot in the hope it would prove more attractive than the peanuts, and set the pot again! We had spun quite a way round on the anchor during the night due to the wind, so we had to row over to the pot to retrieve it. Again, there was something in it! Again, it didn’t look like a lobster…. 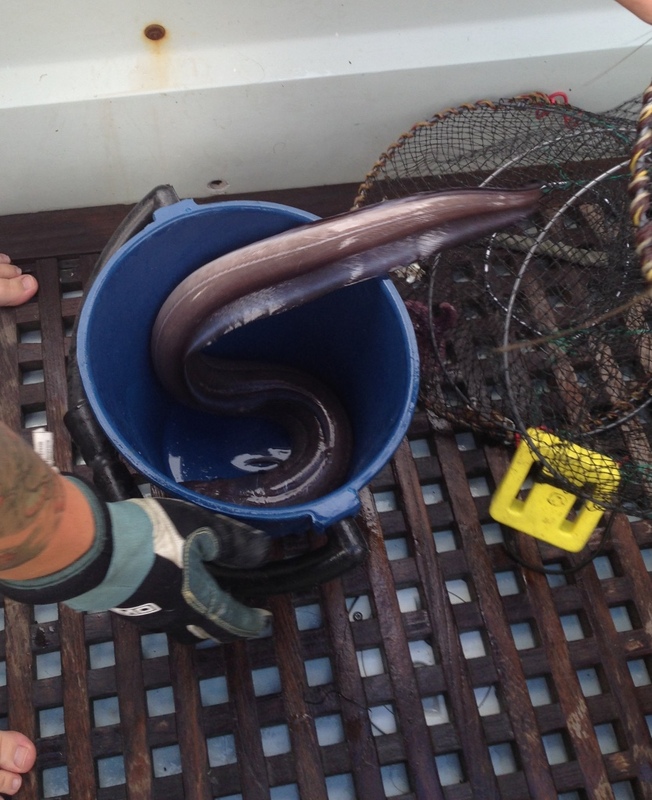 Nope, nor an octopus… It was a large eel!! And a small star fish and some whelks to keep him company! 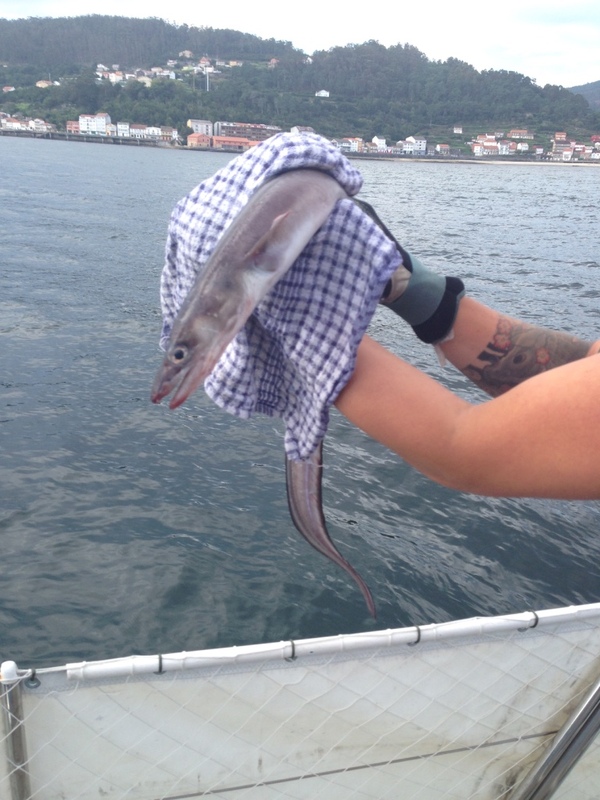 I have almost no qualms about dispatching fish (I would have found it very difficult to see off the poor octopus), but if there’s one thing in the world that I really struggle to eat, it’s eel. I have tried it in many forms, but unfortunately (or fortunately for the eel), it remains off the menu for me. So, again, with only 50% of the crew up for eating it, we decide to pop him back in the water together with his fellow captees! This was more of a struggle than the octopus, and required a glove, a bucket and a tea towel… He was so slippery, he just slipped out of my hand (as, with hindsight, eels are famous for being) and I resorted to forcing him back out of the pot the way he’d come in and into a bucket. Which worked really well… until he jumped out of it and slid across the deck. Cue lots of Ealing Comedy moments where I chase him around the deck and occasionally grab him; he slips out of my hands again and slithers on etc – you get the picture! Jamie stood laughing and trying to take the trophy photos… He suggested a tea towel, which was a bit of stroke of genius, and we managed to grab him and pop him back in the water. 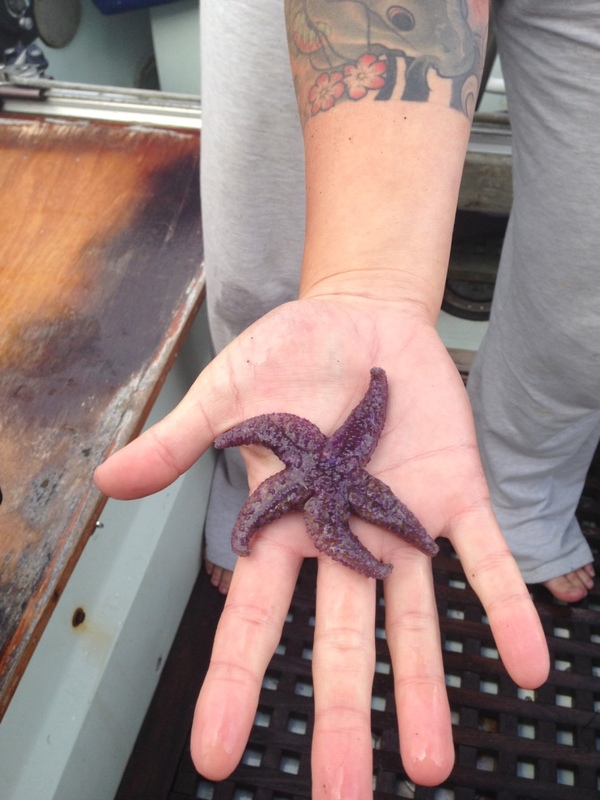 The little starfish was beautiful and infinitely easier to send home to his friends, as were the whelks. We thought that maybe Muros is not the place for catching lobster, so we resolved to try again further down route! The Eel’s act of escape, precipitating the Ealing Comedy style chase around the deck! Off he goes, back to his mates! 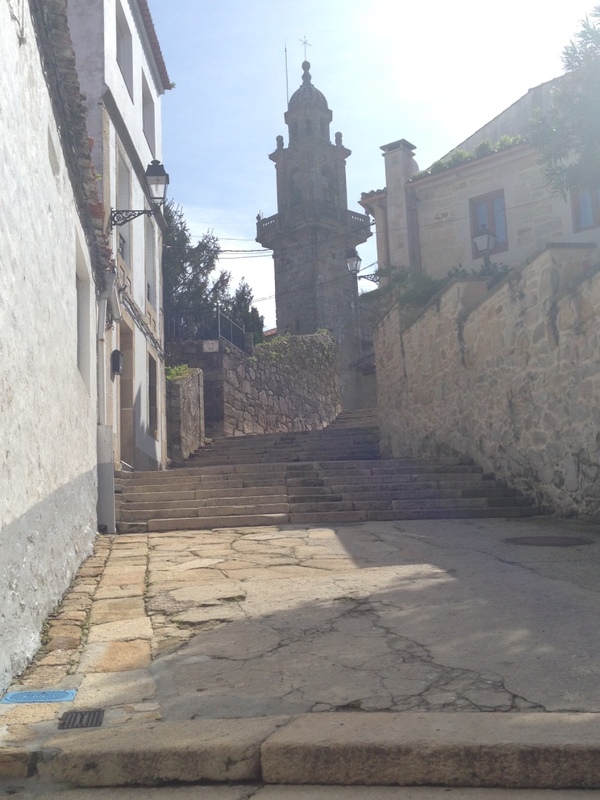 Tuesday 13th October marked exactly one month of being away, and we spent it in Muros – our final day there. We have covered 787 nautical miles in our little boat already, at a maximum speed of 9.7kts, and an average of 4.8kts! It feels like so much, but equally, we are increasingly awed by how big the sea and the world really is. The barometer finally started to rise in the afternoon and we checked our the other weather forecasts we use (primarily windguru.cz, windyty.com, and passageweather.com). It looked good, and not just for the following day – we had a good two or three day window before the next bout of gnarliness, so we revised our route – 48 hours would get us to Nazaré (with a marina about which we’d heard mixed things, not too far from Lisbon) well before the bad weather, and would be a good chunk of our journey south ticked off. In the future, we would like to do more of the Rias, and also stop in Vigo and Porto, but we have plenty of time (and good weather hopefully) to do this in detail next summer. Priority one is still getting around the Algarve and to Gibraltar where we will spend a couple of months over Christmas and New Year.